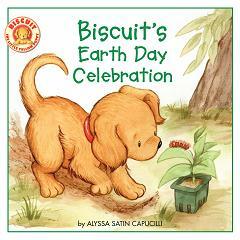 This new title from Alyssa Satin Capucilli introduces kids to the concept of Earth Day and provides suggestions for how kids can take care of the earth. I appreciate that the author considers caring for animals to be a part of caring for the earth. And of course kiddo loves Biscuit! Among the ideas presented are conserving water, planting a garden, cleaning up trash, providing nesting material for birds, and using cloth bags to go shopping. Although it’s not mentioned in the book, veggie kids can add eating plant-based foods to the list!